We have all experienced that sinking feeling when a piece of equipment we rely on fails, normally when you most need it! An oven as you’re getting the Christmas dinner on or a car as you’re leaving for your summer holiday. It’s bad enough when anything breaks down on us, but when it is something you rely on for your job or business, it is all that more serious. Working life for a farmer is tough at the best of times. So, when there’s a problem with your tractor or another vital piece of your agricultural equipment, it can be a major problem and a risk to your livelihood, putting you in a position you really don’t want to be in. Over the years agricultural machines have evolved to be more efficient and reliable, but they still require regular maintenance and can still break down. Whilst the machines have become more technical, with advanced measurements and diagnostics, when it breaks down, whether the machine is new or old, the fitting of the part and fixing of the machine hasn’t really changed at all. With the farmers self-reliance, often it’s not the fixing of the problem that’s the issue, it’s getting the part needed for the repair, so you can fix your piece of kit and get up and productive again. 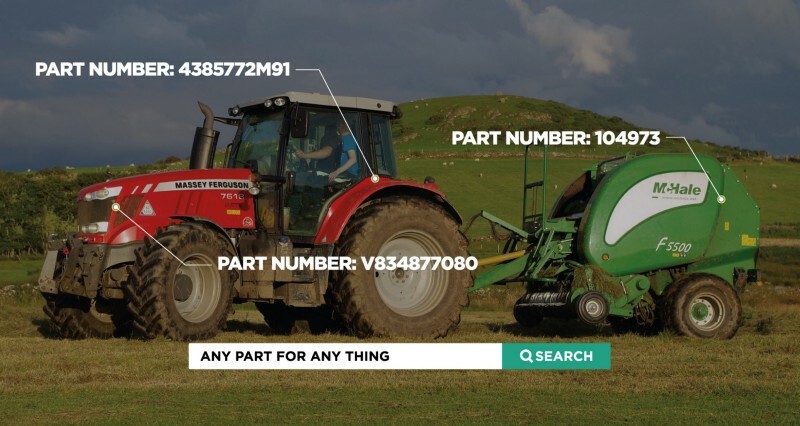 Current methods for sourcing parts can take time, energy and effort that would be better spent running your farm. The cost of the part is not only the purchase cost, but also the time spent travelling to a trade counter, phoning a wholesaler, comparing online stores or ploughing through manufacturers literature. It’s also the confidence in knowing that you will get the right part, that you can trust who you are buying it from and that it will arrive in time. BuyAnyPart is the online destination for parts and associated equipment. We provide you with a simple and easy to use parts system, matching the part you need for your exact make and model. Simply go to www.buyanypart.co.uk, enter the part you need into the search bar, hit enter and leave the rest to us. With over 500,000 parts available online the chances are we have the part you need, and if we don’t then we provide a part identification and sourcing service. We provide OE and replacement parts, allowing you to make the decision on the grade you want. All prices shown include Vat and UK delivery, giving you the confidence that the price you see is the price you pay. No waiting to get to the end of the checkout process to know what the final price will be! So, whether you have a broken-down John Deere, a non-starter New Holland or a temperamental Massey we will be able to provide you with the part you need. Just visit www.buyanypart.co.uk and search for the part. And that’s it, the part you want and need, simply and quickly. When you’re stuck in the mud, we’re the experts that turn up to tow you out, help you fix the problem and set you on your way. Having that helping hand when you need it most is why we’re one of the most trusted parts suppliers available today. Parts are available to purchase twenty-four hours a day, three hundred and sixty-five days a year because being a farmer never stops, so why should we? Check out www.buyanypart.co.uk and find the part you’re looking for.